Keep the summer weekend vibe going… just because it’s time to get serious soon doesn’t mean your weekender style has to be stored away. You may as well take advantage of the outdoors and the warm weather as long as possible. Go to the park for lunch, take a stroll home, watch the sunset on the rooftop, and just pretend it’s vacation weekend anytime. Here’s what I’m carrying around with minimum essentials to have my spontaneous BOHO weekend vibe ~ on my time. This bag still has a shape and acts like a tote. | bag can also hold a more serious purse if needed. A little frill with hand beaded frill + coins, and the tassels make me think of the beach. Jacquard shoulder bag by Bret Boho. ($72). + feel good: A percentage of all Bret Boho sales go to JDRF and beyond type 1 to help find a cure for type 1 diabetes. Thongs by Havaianas. You know kicking back in these GOLD flip flops need no words. Perfect with your end summer tan. ($26). on the go summer mood! 3-in-1 summer sandals by Cambiami. Um, not only are they attractive, this thong sandal comes in 3 variations. I picked the pyramid studs x python x patent. You can also pick your own three in a set, from bubblegum pink to bling. You can change up the straps to go with jeans + tee to a little black dress- and they fit inside the bag to change into after a serious day. Leather, set about $100+ at Cambiami. Just because it’s the end of summer, it doesn’t mean you can go bare outdoors. Besides the YOU-KNOW-BETTER than going out without sunscreen on your face, remember that the bugs are even more potent + dangerous end summer and early fall. 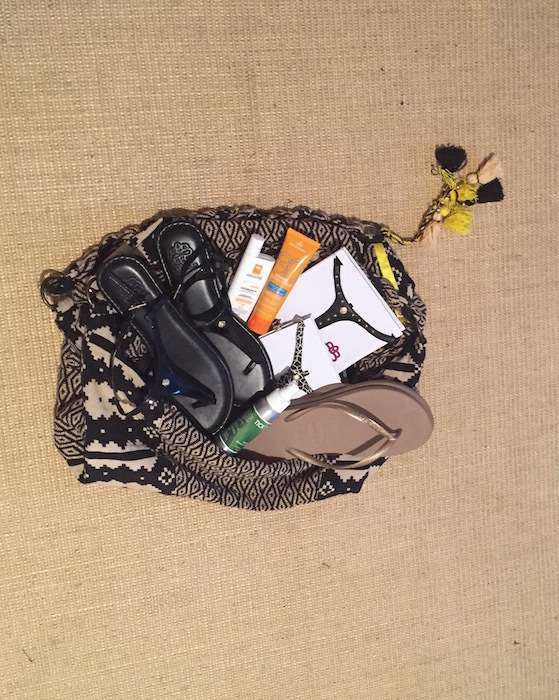 These 3 must-haves are always in my outdoor bag, and I even carry it in my daily tote. Put this on your dainty feet, legs and arms to stay safe from the bug bites (and tick bites) until the winter freeze. Organic oil smells fresh and lasts awhile. The formula is soft enough to use as a moisturizer at same time, so add a fresh perky scent, moisturize, and repel the bugs all at once while wearing your snazzy sandals. TickTockNaturals organic insect repellent. ($15). + feel-good: A portion of each bottle sale goes to Lyme Research Alliance for funding in research, education of Lyme Disease and Chronic Lyme Disease. Good enough to use every day! Sunscreen with tint. This protects and gives you a glowing bit of tint. Advanced 100% mineral sunscreen + antioxidant protection. La Roche Posay SPF 50 tinted sunscreen for face With Cell-Ox Shield™ antioxidant technology. Light tinted sunscreen, fast absorbing, weightless texture, and OK for sensitive skin. Water resistant (40 minutes in water/sweat or after 2 hours). Plus you can wear it under makeup anytime. La Roche-Posay:Anthelios 50 Mineral Tinted ($33). Md Solar Sciences Mineral Tinted Crème SPF 30: I like the texture of this when I want more flawless face coverage, but still have to be out while it’s bright out. The texture is luxurious with a matte finish, and oil-free. Water resistant up to 80 min, contains Antioxidants: Vitamin C, green tea, cranberry fruit and pomegranate extracts, as well as ‘safer’ Eco-cert zinc oxide. ($32). Put this on your dainty feet, legs and arms to stay safe from the bug bites (and tick bites) until the winter freeze. Organic oil smells fresh and lasts awhile. The formula is soft enough to use as a moisturizer at same time, so add a fresh perky scent, moisturize, and repel the bugs all at once while wearing your snazzy sandals. TickTockNaturals organic insect repellent. BOHO weekend vibes commentary by Brigitte Segura, written by Nyaa Ferary. photo credit: Brigitte Segura | FashionDailyMag. a few hair trends. more hair stories.